Talisman Desktop 3.4 (one user license). English (international) and German versions. Additional Shapes, Clocks, Icons, Menus for Talisman. Most of them are available only on CD. Free Update to all future versions of Talisman, Alteros 3D, Icontoy, Melody programs. Price : $45 US (with shipping). Price : $19 US with shipping. Attention! This disk doesn't contain the license for Talisman Desktop. 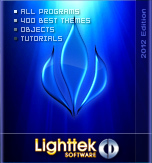 You should register Talisman Desktop separately or purchase "Lighttek CDROM"!